Jalandhar: Zoology Scientist at the School of Bio-Engineering & Bio-Sciences of Lovely Professional University, Shivika Datta, presented her research paper at ‘3rd Green and Sustainable Chemistry conference’ held in Berlin, Germany. Evaluating her research, Department of Science & Technology (DST) Govt of India had sanctioned travel grant to her to share her work with 1000+ global research scientists gathered in Germany. 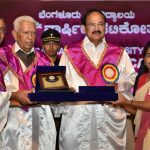 She was one among only 6 scientists invited from Indian Institutions, including 4 from IITs Roorkee and BHU, to share their important and socially useful research-works. Her research is aimed to increase ‘Soil Fertility & Crops Rate’ by using indigenous ‘Earthworms’ as great decomposers of the soil. She has continuously been working on diverse breeding cultures of earthworms at LPU laboratories, including their zoological species- ‘eisenia fetida and metaphire posthuma’. LPU Chancellor Mr Ashok Mittal inspired the scientist to continue working hard for the betterment of the global society. LPU scientist Ms Datta feels that with the excessive usage of harmful chemicals through sprinklings of cocktails of pesticides, particularly in the Malwa Belt of Punjab State of India, both human beings and crops have been regularly deteriorated and damaged in health and survival. It is also one of the main reasons that the belt is riddled with huge number of cancer patients. For this, she forwards to induce large breed of earthworms in the soil so that as great decomposers they simplify complex composition of soil into harmful chemicals less simple soil. She also hints that countries like Canada, Australia, Switzerland, Spain, Austria, Taiwan are preferring such soils or organic farming for healthy cultivation and life. Ms Datta also had vast exposure and got chance to interact with Conference Chair, Director of the Institute for Sustainable and Environmental Chemistry, Leuphana University (Germany), Prof Dr Klaus Kummerer. LPU Scientist has also secured great opportunity to co-work with senior scientists in other top Universities of Germany, Dr. Martin Schadler, Dr Lioudmila Chatalova and a few other researchers, with those further collaborations could be done in the future. In fact, this conference does not provide only a forum for chemistry related topics such as synthesis, technical aspects and its products. On the broader context, it propagates that is necessary to enable long term viable and globally applicable contributions of chemistry to the sustainable development goals (SDGs) as per United Nations.